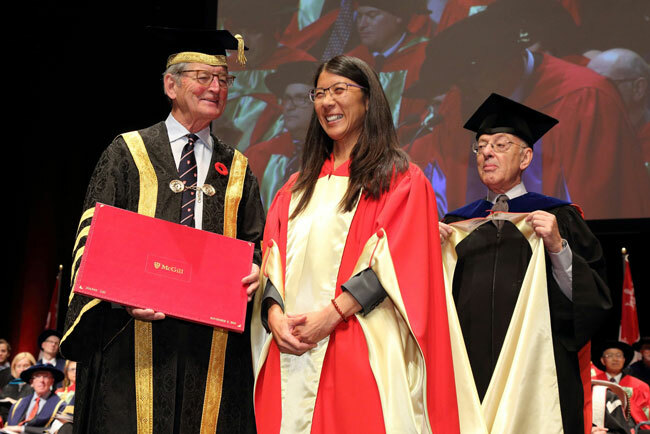 Yesterday, during Fall 2016 Convocation ceremonies, McGill’s newest recipients of honorary doctorate degrees, Joanne Liu and Bertrand Cesvet, challenged graduating students to have a positive impact upon the world. At both of yesterday’s Fall 2016 Convocation ceremonies at Place des Arts, graduating students were challenged to use their talents to make a positive impact in the world. The day began with the morning ceremony for graduating students from the Faculties of Agricultural and Environmental Sciences, Arts, Education, Law, Management and Music. 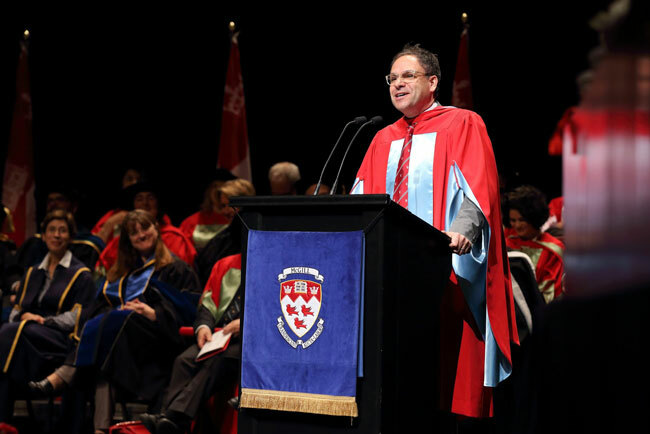 But before making that memorable march across the stage in Salle Wilfrid Pelletier to accept their degrees, students listened to the Convocation address of Bertrand Cesvet (watch the video of Cesvet’s speech at the end of the article), of the award-winning creative agency Sid Lee. Cesvet got some chuckles when he reminisced about his early days at the University. “I came to McGill in 1983. The Cold War was raging. Michael Jackson’s Billie Jean was topping the charts,” he said. “My English was very bad and, sadly, I was wearing a mullet. But the truly important question, he continued, is neither what you will do next, nor where you will do it. Rather, it is with whom. Paying homage to everyone from his parents and wife to his friends and business partners, Cesvet reminded the audience that people are the most important aspect in any life. “Take a moment and look to your right and look to your left,” Cesvet told students. “Regardless of age, race, political views, social status, sexual orientation or gender, we all share the same spaceship. Every person in this room has the potential to make a positive difference in your life. Some may turn out to be your lifelong friends and become your extended family. Others may teach you something. Some may become your business partner. They may one day care for you. They may even prompt you to write a love letter. Joanne Liu, International President of Médecins Sans Frontières/Doctors Without Borders, began her address for thanking McGill for taking a bit of a chance on her more than 25 years ago. Liu admitted that being a McGill med student was not easy. “I wanted to quit,” she told students graduating from the Faculties of Dentistry, Engineering, Medicine, Science, and the School of Continuing Studies. In fact, the impulse to quit has been a constant throughout Liu’s distinguished career. Liu proceeded to tell the audience about the 2014 Ebola crisis in West Africa and how the situation quickly escalated to epidemic proportions, leaving her and her colleagues at Médecins Sans Frontières who were working on the front lines to feel all but abandoned by the global community. “[We] had no more capacity to take more patience [in our clinics]. We could only open the doors for 30 minutes in the morning to fill up the beds of the people who had died overnight,” she said. But stay they did. “We rose to occasion again and again – up to the breaking point. Constantly asking ourselves how far we could go and how long we could last. But we stuck with it. Despite the loss of patients. Despite the loss of colleagues,” said Liu. “Because caring for these Ebola patients had meaning. Liu closed her address by answering a question often posed to her – aren’t you tired of working in such hopeless situations? “My answer never changes. No,” she said. “I work with people who have no choice and I believe we have to give them our best precisely for this reason – because they have no choice. I don’t pick. I don’t take. I just give the best I can. This is what brings meaning to my life. Click on the thumbnails to watch yesterday’s Convocation addresses.